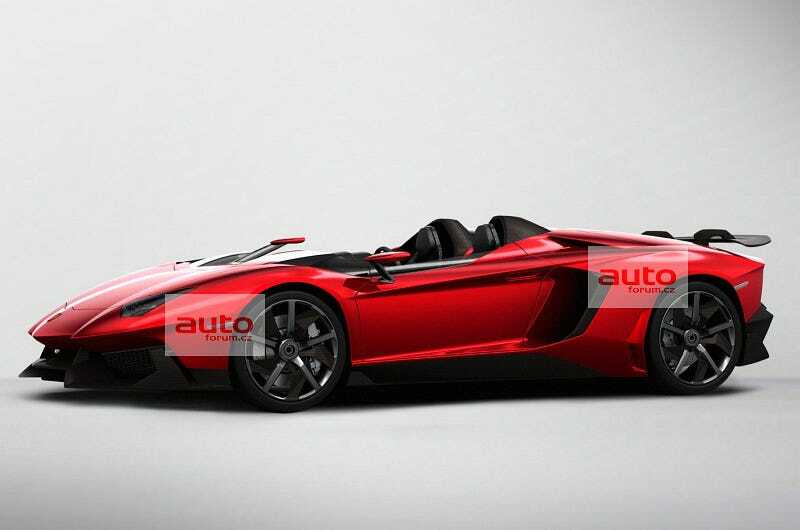 Surprises are rare these days, so much respect to whomever thought the Lamborghini Aventador should lose more than just part of the roof for a one-off roadster version. The Lamborghini Unica is an Aventador with a vent and a door but no roof, windshield or pillars. It's insane and hopefully real. As the watermarks indicate, these two images come from AutoForum.cz, who say they are 100% accurate images of a vehicle that will be revealed at the Geneva Motor Show next week. They also call it the Aventador J, although Unica seems more appropriate (it's what GTSpirit is calling it and Lamborghini released a teaser video with that name a few hours ago) given they're production plans. AutoForum.cz says the car is not just a concept but, like the clearly influential Sesto Elemento, it'll actually go on sale — albeit in limited quantities. Like, they're only building one of them. Seriously, put your business manager on the Gulfstream to Geneva right now if you absolutely need one. Whatever this is. Whatever they'll call it. Wherever they put it. We will find it. You cannot hide something so mentally beautiful form us, Lambo.